Ready America will also feature the "Big Shaker," the world's largest mobile earthquake simulator and the Orange County Fire Authority will have live demonstrations at 11am, 12pm and 1pm. 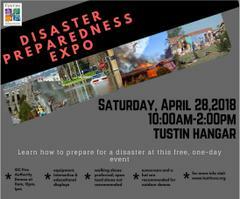 REGISTRATION and a City of Tustin LIABILITY RELEASE AND ASSUMPTION OF RISK FORM is required for entrance to the event (click on each link). Walking shoes are preferred and open toed shoes are not recommended. For more information, contact Joe Meyers at jmeyers@tustinca.org.